One of the things I really liked about Atari, was that they continuously developed multi-player games, to allow for simultaneous play with at least one other player. I also felt that they pushed the envelope of in-game sound better than many of their competitors. Atari produced a lot of polished games in the 1980's and Super Sprint is one of their best I think. Super Sprint is a sequel to the game 'Sprint' which was released in 1978. - A game that I also played a great deal. 'Sprint' was a solo game with a black & white display. It had a very basic set of tracks that were made up of 'dots'. The cabinet however, did sport a gear stick with four gears! It was very tricky to control your car at full speed, but it was great fun! With Super Sprint, Atari brought the 'top down' racing game into terrific full colour and brilliantly, made the game so it was possible to have three players all driving at the same time. This was the first 3 player arcade game I can remember seeing. 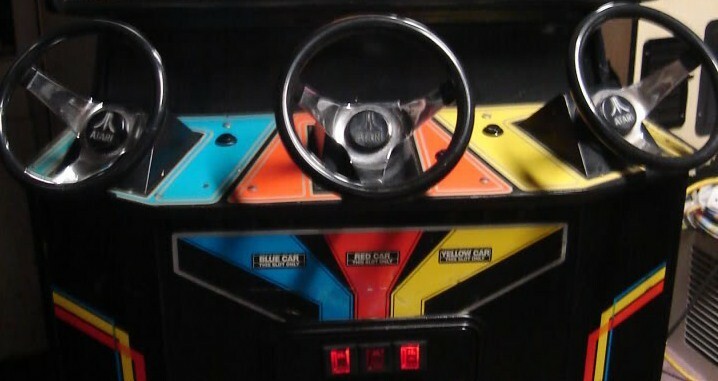 The arcade cabinet was fairly big as it had to accommodate three steering wheels and be wide enough for three people to stand adjacent to eachother. The cabinet side-art was pretty cool and depicted four racing cars trailing different light trails behind them. The four colour theme that was used (blue, red, yellow & green) is carried right throughout the game design. The controls consisted of (for each player), a steering wheel and a single foot pedal (accelerator). There was also a single 'start' button for each player. There was no brake pedal in Super Sprint. Decelaration was achieved by simply lifting your foot off the accelerator. The steering wheel was a continuous rotation wheel. So you could never reach a maximum 'lock'. Rather, you could just spin the wheel continuously in any direction. There was no resistance or feedback on this and consequently, I would always test each wheel out before playing (especially when visiting a new arcade), so I could be sure I was using the smoothest wheel. The game did not feature different car types. So all things being equal, it did not matter which car you selected. The only difference was the car colour and your standing position in front of the monitor. Some people preferred being in the middle (as I did) because you are square on to the display monitor. Others preferred the outside positions as they afforded you more room to flail your arms around! One piece of clever design by Atari, was the positioning of the steering wheels. The two outside wheels were 'angled' outwards in relation to the screen (see above image), affording more room for the players. A good bit of design! The immediate aim is to obviously win each race. But as a bare minimum, you must not be placed behind any computer controlled cars. (The game refers to them as 'drone' cars). If a drone car finishes ahead of you in a race, then you will need to furnish the coin slot with more money, in order to continue playing. Drone cars become steadily faster the longer you manage to win races ahead of them. Should you lose and then decide to continue (by inserting more money) their speed is temporarily reduced back again. Points accrue constantly so long as your car is driving the correct way round a track. It appears that this is based only upon distance travelled. The points tick up at a rate of 10 points every set distance click. This score is therefore not dependant upon how fast you drive. However, bonus points are awarded in a tiered system, depending on your race finishing position. (See 'Winner's Circle' below). During the arcade era, my own personal aim (like all arcade games), was to simply see how far I could get and how many points I could score, on a single credit. Super Sprint contains eight unique tracks. When you begin the game, you can select the track that you would like to start on. The only impact this has, is that the game offers you bonus starting wrenches for starting on some of the more difficult tracks. If you are playing on your own, this is significant, since begining the game on what is classed to be either of the two most difficult tracks (track 8 and track 5) affords you 3 bonus wrenches. Consequently, after completing the very first race, you will be able to immediately upgrade your car. I only ever started on track 8 for this reason. When you are actually playing the game, each track is visibly numbered onscreen (at the bottom left). The Atari design team came up with some awesome track names. They are called (for example) 'Track 1' or 'Track 5' etc! Shown below are all eight tracks in the game. I have placed them in the order the game rotates them in. Click on an image to view it full size. Track 2 - This track is an easy one which just involves some simple left turns. However, you need to be careful when approaching the jump. If you hit the tornado as you jump, you will crash into the wall when you land. Also, early in the game, if you have no acceleration, occasionally you may find you do have the time to get up to speed for the jump, (should you crash just before it). Track 5 - This is one of the most fun tracks I think. It has three gates that open and close periodically. Because of this, it can be unpredictable. This track is the 2nd fastest if you manage to hit all three gates 'open'. Track 8 - The longest and hardest track. Beginners struggle on this track due to it's length and the narrow sections of track. It's also one of the easiest tracks to be 'bumped' into the walls by a drone car. Track 4 - A fun track this one. A roundabout, a short straight and another tight corner to finish. Great fun when you have little or no traction. Players need to be careful to not catch the back end of the car on the track walls, as this can easily cause a crash. Track 1 - The easiest and quickest track. With a fully customised car, you can drive full speed around this track with no let-off. Be careful to take the inside line when going toe to toe against the Drone cars on later levels. Track 3 - Another short, fun track. The single gate can occasionally work against the player in later levels, should the Drone car catch it. Also, be careful not to get 'bumped' as you approach the roundabout. This can sometimes cause you to either get pushed around to right and miss the entrance to the roundabout - or knock you the wrong side of the 'island'. Track 7 - This track is full of tight turns and includes the double hairpin just after the start, a really fun section. The two final corners of this track are banked. Consequently, you can drive much faster around these corners that you otherwise would normally be able to. The drone cars can sometimes be quite annoying on this level, with a good deal of bumping possible. Track 6 - This track can be tricky in later levels. It involves quite a few medium speed corners and a jump on the final straight. Generally speaking, it is best to avoid the jump, especially in the end-game, as the slightest mis-alignment will cause you to lose. With a fully customised car, you can drive full speed around the final bend with no lift. In Super Sprint, players can upgrade their car to improve its performance. In order to do this, you must collect 'wrenches' (or 'spanners' if you are from Blighty). During a race, a spanner (or potentially two, depending on the number of people playing) will appear randomly on the track. The first car to drive over it, will pick it up. When the current race ends, if you are holding at least 3 spanners, you will be presented with a screen where you can choose the area of the car you wish to upgrade. (See image on the left). Players turn the wheel to select the desired upgrade and can hit either the accelerator or start button to confirm their selection. You cannot 'save' spanners and so are forced to spend them. Whilst you are within this screen, a ten second countdown clock quickly appears. If, at the end of this countdown you have not chosen an upgrade, the game annoyingly auto-selects 'Increase Score' - no matter what the arrow is pointing at! - A slightly strange (or mean) bit of coding in my opinion. One spanner always appears after the lead car completes its second lap. If two or more (human) players are playing simultaneously, you will normally have the opportunity to pick up two spanners during a race. This means you can hold a maximum of five at any one time. If an additional spanner does appear, it will do so after the lead car completes the 3rd lap. The second spanner normally appears in the same position as the first spanner (occassionally this is not the case). From the above upgrade screen, you can see that there are five levels of upgrade available for each item. So a total of 45 spanners are required to fully upgrade your car to maximum specification. On any given track, I believe thare are four possible locations that a spanner can appear. The location that is used, appears to be random. Some of these positions are better for the players than others, since the drone cars cannot always reach them (because they follow a fixed path on each track). Other positions though fall on their drive-path and will be collected by the computer should they drive over them. There are largely self explanatory but it's worth noting a few things about them. Generally, it is better to initially equip yourself with more speed and more acceleration. After you have reached two or three upgrades of each of these, it is necessary to add some traction. Prior to this, you can still corner fairly well, using vigorous wheel spinning! At full specification, it is possible to drive full speed around tracks 1, 3 & 4 with no braking. After every race, the 'Winner's Circle' screen is displayed. In this screen, the cars are shown ranked in order of how they completed the race. The winning car sits at the top of the podium and a crowd of people wave flags in the winning car's colours. Also displayed are the average and best lap times for each car and a standard set of bonus points for coming 1st, 2nd or 3rd. I always liked this screen. It gives you a little rest-bite between races and there are some nice animations displayed for the losing car. (See below). It was little touches like these that made Atari stand out slightly from other game developers I thought. They were always polished and well presented. My favourite was the puff of smoke animation. The mechanic leans in to take a look at the engine and a puff of smoke suddenly bursts out and he jumps back in surprise. Let's look at each one. Oil Patches - These are dark brown patches which, when you drive through them, cause your car to spin. The spin always corrects itself and if left alone, the car will always end up facing the same way it did before hitting the patch. The danger with mud patches is that if you hit one just before a wall, it will cause you to crash when you hit the wall. Also, since you are a 'passenger' during the spin phase, if you hit one, on some tracks, it may cause you to miss driving through a gate etc. Drones are also affected by mud patches. Mud Patches - These have the same affect as oil patches and seem to differ in appearance only. They appear as black patches on the track. Water Puddles - These light colour puddles cause your car to momentarily slow down. They do not cause you to skid or lose control. Banked Turns - Only one track has banked turns and that is track 7. There are two on this track and they are identified as such by having lines scored across them. On these two turns, it is possible to drive signifcantly faster than you otherwise would be able to. Bollards - As you progress further through the game, you will start to see three bollards appearing on each track. (See below for more information on this). These are obstacles intended to make it more difficult for you race. They are recessed into the ground at fixed positions on each track. Only one bollard is raised at any given moment. Bollards affect both player and drone cars. Bonus Points - These appear in not so exciting denominations of 100 and 150 points at random positions periodically during a race. Drones can also pick them up if they happen to appear on their drive-path. Traffic Cones - Deeper into the game, eventually four traffic cones will appear on the track, in addition to the bollards. If the player's car hits one, it is momentarily slowed almost to a stop. Once a cone is hit, it disappears for the remainder of the race. Drone cars are also susceptible to cones. Hitting one of these in the later stages of the game can make the difference between winning and losing. Helicopters - If you crash your car, a helicopter flies onto the screen to replace it with a new one, as near as it can to where you crashed. Generally speaking, if you crash in any of the four 'corners' of the track, the helicopter will fly onto the screen, from the opposite corner. This takes time! The rotor blades of the helicopter are colour coordinated to match the colour of the car being replaced. Very nice! Whirlwind - The whirlwind appears from the fifth race onwards and moves randomly around the track. If you touch it, your car is spun. However, just like oil and mud patches, your car will always end up facing the same way when it completes it spin. Drone cars are strangely unaffected by whirlwinds. Despite all of Atari's loving touches in the game, they still felt that people who do not have a middle name should be punished! This means no special characters are available when entering your name in the high score table. The Super Sprint high score table was pretty impressive. It displayed 30 scores, all on one screen. One thing that always annoyed me though, was that the table was only displayed for a very brief period (just a few seconds) - so you barely had time to see it; which kind of defeats its purpose! It is possible to blow up your car in Super Sprint in several ways. The most common way is to drive too quickly head on into an obstacle. This is often caused by hitting an oil/mud patch or the whirlwind, just before a corner. When cornering, the game puts special emphasis on the back end of the car. So if you catch the rear of the car on a wall, (for example when cornering the roundabout on track 4) this will cause your car to explode. You can also crash if you 'fall' off the jumps on tracks 2 and 6, or fall off the 'overpass' in track 8. You cannot directly crash by hitting other cars though. The game is more fun (I think) in the earlier stages when the car has less grip and you have to skid your way around corners. However, it is not possible to play the game indefinitely without upgrading your car. Drones are immune to the whirlwind. On track 8, using the shortcut is useful for multiple reasons. Firstly, it's quicker! Secondly, it is never used by drone cars so it's a superb place to overtake them. And finally, if you are playing in a multiplayer game and are behind a drone car in the final stage of the lap, if you manage to get your nose down the beginning of this shortcut, the game tends put your car ahead of anyone else who has driven the 'long way round' the corner. Many, many times, this has saved my bacon. It is possible to not register a legitmate lap on some tracks and it's important to know how this can occur, otherwise you may think you are about to complete a victory and you just fly over the line and carry on the race! Firstly, going backwards around the track will never register a lap. Thankfully, you cannot go into ' negative' laps by going backwards, but the lap counter will just stay where it is. Secondly, if you do not fully go around the roundabouts on either track 2 or track 3, the lap will not count. You will have to go round again. Finally, if you happen to be a victim of the track 8 bridge bug (see below) - or you do it on purpose, your lap will also not count. If you suspect that you might tricked the game, keep an eye on your lap counter as you go over the start/finish line. Does 'traction' mitigate the mud patches? It seems it could...? You do not get 'driving points' for driving backwards around a track. Your score will stay static. Also, you will not start gaining 'driving points' again until you turn around and catch back up to were you first turned around! Sometimes a spanner can be picked up but will then remain visible on track. This only happens in multiplayer games with other human players. Unfortunately, you cannot pick up the spanner multiple times though. It is possible to drive over the finish line backwards. You can do this by skidding when you have little traction, or by hitting the whirlwind just before the line. The position the cars stop on the chequered flag line does not seem to be consistent. If a player has money (credits) in their slot, and that player loses in a race and would otherwise go out of the game, Super Sprint automatically takes that credit and brings the player back into the game. This is unusual in arcade games. Normally, the player has a choice as to whether they wish to rejoin. Allowing them to 'sit out' the game with the credits pending. On track 3, occassionally a drone car will start the race and then get 'stuck' in the corner of the screen, continually bumping into the wall. (See image top right). If there are three of you playing, this was brilliant as it meant you could drive indefinitely around the track because there was no drone car to beat you. However, you had to be careful to only drive around backwards otherwise someone would win the race! On track 8, there is a bug with the game detecting your position on the track. As shown in the image on the right, if you drive off the overpass in the position shown, you will drive seamlessly onto the lower track and not blow up. Unfortunately, the game will not count a lap completed in this fashion, so there is no real benefit to the player. Once you have fully customised your car, if you play well, you can potentially play the game indefinitely. It is possible whilst fully customised, to drive flat out on nearly every track. Just a few corners on some tracks require a bit of lift on the accelerator. What you tend to find though at this point, is that if a drone car 'bumps' you into a wall, it is very, very difficult to catch up again and win, simply because the drone cars are so quick. Fairly quickly into the game, bollards begin to appear on the tracks. With the exception of Track 8, the player has to contend with this and avoid them if possible. This is fairly easy to do most of the time, since you can anticipate which bollard is going to extend out of the ground. Below is an image of each track, showing where the bollards appear. They always appear in the same position for any given track. Only one bollard is fully extended at any one time. However, one bollard ascends as another descends, so it is possible to have two of them causing a hazard for a very brief instant. If positioned perfectly, it is possible to drive between the bollards. Though this is difficult to pull off whilst racing. After a time, bollards are no longer seen as an enough of a threat to the player, so the game throws in traffic cones as well. All tracks are affected but some have them positioned more difficultly than others. On some tracks it is very hard to avoid hitting at least one of them. The image on the right shows the position of the cones on Track 1. This particular track happens to be quite easy, as the player can simply drive up through the gap in the middle of them. When you hit a traffic cone, it brings the car to a complete stop. Fortuntately, once a cone has been hit by a car, it is destroyed and disappears from the track for the remainder of that race. Below are the cone positions as featured on tracks 3, 5 and 8. So there you have it. What a cracking game Super Sprint was (and is!) I wonder how many amusement arcades still have a working Super Sprint machine in them today?